Actor Robert Davi Sings Sinatra in Budapest 2015. Robert Davi established himself as Hollywood’s go-to gangster and hard-nosed cop, and everything in between now touring, performing classics by his idol Frank Sinatra. 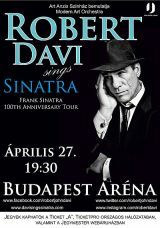 Robert Davi in Budapest “On the Road to Romance” concert … on the on April, 27. 2015., at the Papp László Sport Arena. Get ready to take part at a rare, classy treat where Davi will be combining his acting talents with a keen ear for Sinatra’s phrasing. Davi has a colorful acting career, appeared in over 100 movies and dozens-and-dozen of TV programs and on stage … „From the memorable villain, Colombian drug lord Frank Sanchez … in the Bond film “License to Kill”. As to his stand-out performances in … “The Goonies,” … “Die Hard,” … ”Kill the Irishman,” … “The Iceman” and many other films as respected series … “Profiler” … ”Stargate: Atlantis.” His tough masks and inner sensitivity, had perfectly brought his roles as a Palestinian terrorist in the award-winning TV movie, “Terrorist on Trial: The United States vs. Salim Ajami,” and in memorable appearances in “CSI: Crime Scene Investigation,” ”Without a Trace,” “Law & Order: Criminal Intent,” “Criminal Minds” and many more. He has garnered praise from critics, directors and co-stars, including Steven Spielberg, Richard Donner, Blake Edwards, John McTiernan, and Paul Verhoeven. Filming opposite with no less famous actors as Marlon Brando, Roberto Benigni, Bruce Willis, Clint Eastwood, Benicio Del Toro, Danny Glover, Michael Shannon, Chris Evans, James Franco, and Val Kilmer. While Davi is recognized as one of film’s best-known tough guys, he has been winning the respect and admiration from fans, critics and fellow artists with his expressive classy singing. Davi Sings Sinatra: On The Road To Romance, produced by the legendary Phil Ramone, shotted his way into Billboard magazine’s top 10 to the sixth place in the traditional jazz chart. In deed, Davi is mostly known by his acting, but at an early age when he was 15 won the First Place at the prestigious New York State School Music Association Solo Competition. He kept on studying and as a young adult attended at several top vocal teachers including the legendary Tito Gobbi, Dan Ferro of Juilliard, Samuel Margolis. So no wonder with his first love for music which never abandoned him to show his love for music on the entertainment stage and performing classics by his idol Frank Sinatra.